The night before I found out I was pregnant, I was out at happy hour enjoying a nice glass (or two) of sangria. That was about 5 months ago, and I now find myself sometimes missing the good ol’ days when I could indulge in a nice glass of that beautiful red or white fruity-with-a-kick glass of goodness! Can any of you mom-to-be’s relate? Now at restaurants, instead of ordering wine, I’m asking the waiter if the bartender can whip up a mocktail. It’s actually fun seeing what fun drink they can come up with. Recently, I decided to try out my own mocktails and I’ve been experimenting with different flavors to find fun “fancy” juices that I can drink out of classy glasses. I’m telling you, even drinking water out of a champagne or wine glass really helps you not care that you have to give up the good stuff for the next nine (cough **ten** cough) months. This past weekend I tried my hand at a white sangria and was pleasantly surprised with the results. I combined a non-alcoholic Moscato, peach juice and ginger beer for a sweet but spicy concoction. 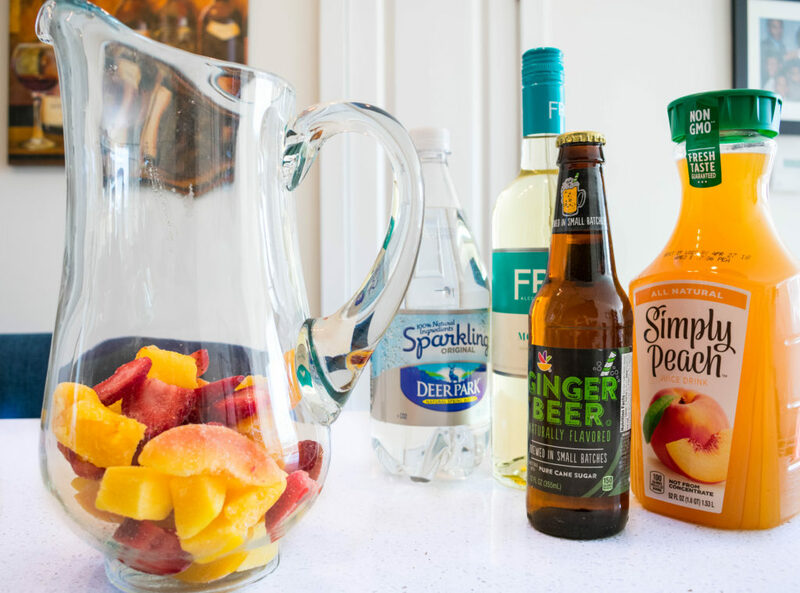 The non-alcoholic Moscato can be found in the grocery store in the section where they sell cocktail mixers and it’s called FRE. If your local store doesn’t sell it, white grape juice would be a good substitute. 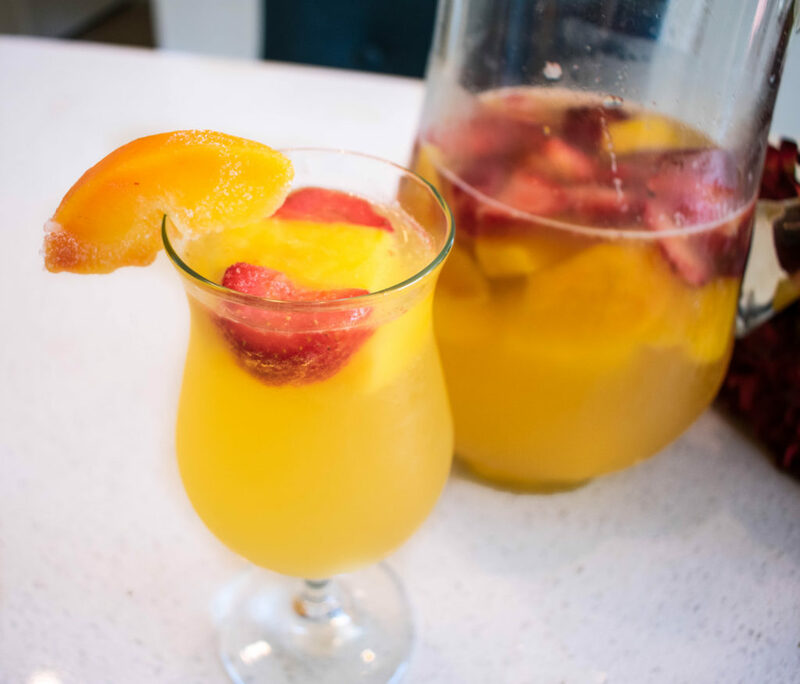 The recipe as is will provide a sangria on the sweeter side. If you like a really strong ginger taste, just add a bit more ginger beer. Step 1: Add frozen fruit to a pitcher. 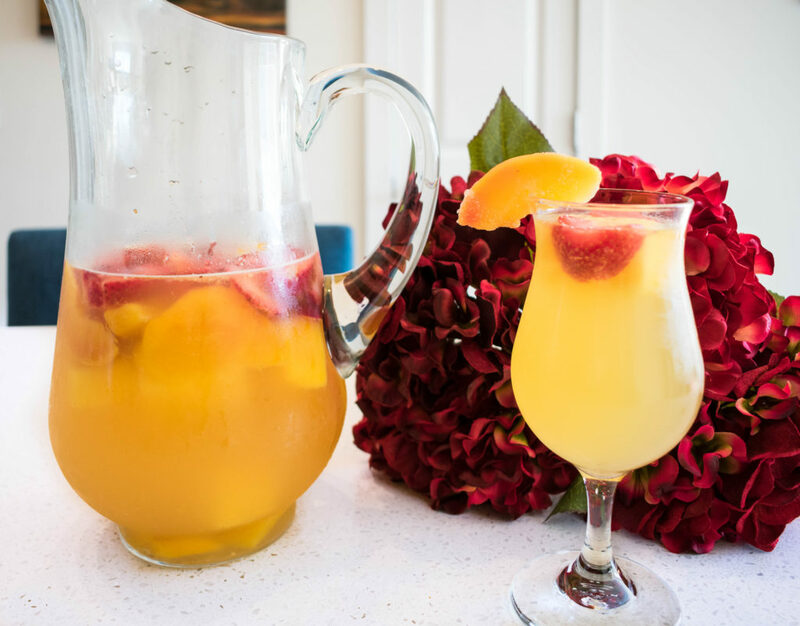 Step 2: Add the non-alcoholic Moscato or grape juice, peach juice and ginger beer to the pitcher and mix well. Step 3: Refrigerate for about 2 hours. Step 4: Pour sangria into a fancy glass and top with a splash of seltzer water and more frozen fruit. Step 5: Put your feet up and enjoy! Growing up, food was the staple for every major event, and my family made it a point to introduce me to many different cuisines. They might also be to blame for my slight obsession with cocktails and small plates. I mean, I was the 5-year-old at dinner ordering a virgin Pina colada and shrimp cocktail! Nevertheless, they ingrained in me my love for food and the amazing abilities it has to bring people together. “Don’t tell me what you ate, tell me who you ate with.” (Parts Unknown, Anthony Bourdain) I recently relocated to Washington D.C., from New York City and am obsessed with the D.C. brunch scene! Something about the casualness of drinking bubbly in the middle of the day really speaks to my soul. I also have a weird obsession with cupcakes and cheese, not together, but if someone could make that work, I’d be down. I’m excited to share pieces about my brunching adventures, happy hours, and classy things in between that are best spent with friends and/or loved ones, as well as sharing experiences from D.C. foodie events. Check out more of my champagne-ing, cupcake eating, D.C. life at my blog Cupcakescaviar.com.